side – so I finally figured out how to do it in Excel. 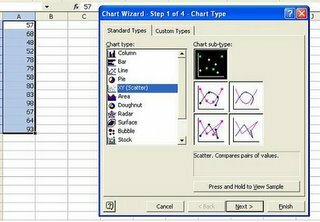 Although Microsoft keeps the ability to do linear regression, even with basic Office XP, pretty well-hidden, it is trivial once you figure it out. Now comes the moment of truth. 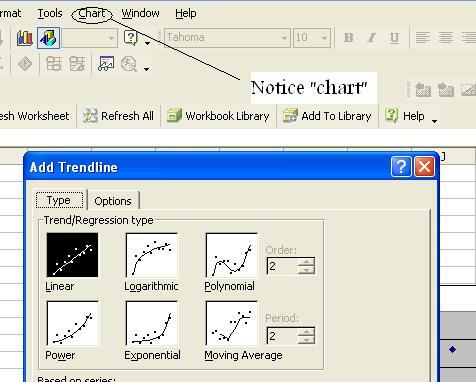 While your graph is highlighted, look at your Excel toolbar, and you should see a new menu, Graph, probably to the right of tools. Choose Chart>Add Trendline>Linear>OK. 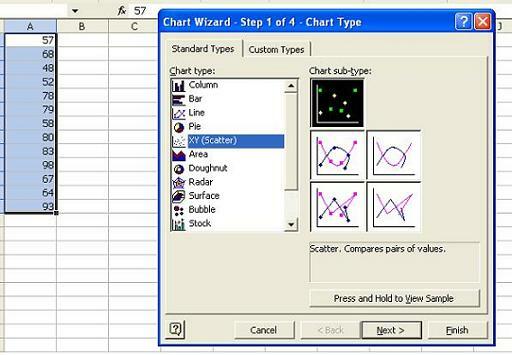 Excel will will do the linear regression and add a line showing the trend of your datapoints. It should look something like this the screen shot on the left. This is somewhat of a statistics hack. After all, we don’t know how well the data fits the line, which a package like MiniTab would tell us. But it’s free if you have Excel. You can do it tonight on your computer.